This report—the eighteenth annual report—presents the U.S. Energy Information Administration's latest estimates of emissions for carbon dioxide, methane, nitrous oxide, and other greenhouse gases. For this report, activity data on coal and natural gas consumption and electricity sales and losses by sector were obtained from the January 2011 Monthly Energy Review (MER). In keeping with current international practice, this report presents data on greenhouse gas emissions in million metric tons carbon dioxide equivalent. The data can be converted to carbon equivalent units by multiplying by 12/44. Data on ozone-depleting gases with high global warming potentials (high-GWP gases) are obtained directly from the U.S. Environmental Protection Agency (EPA). For this report, updated EPA values were available for hydrofluorocarbons (HFCs); however, no updates were available for perfluorocarbons (PFCs) or sulfur hexafluoride (SF6), and last year's values are used instead. Historical data in the chapter tables are revised from the data contained in the previous Emissions of Greenhouse Gases in the United States 2008. 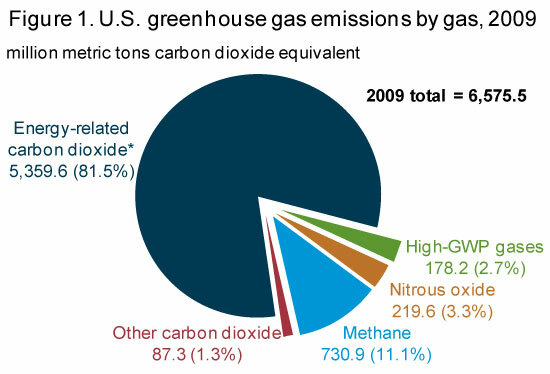 Total U.S. anthropogenic (human-caused) greenhouse gas emissions in 2009 were 5.8 percent below the 2008 total (Table 1). The decline in total emissions—from 6,983 million metric tons carbon dioxide equivalent (MMTCO2e) in 2008 to 6,576 MMTCO2e in 2009—was the largest since emissions have been tracked over the 1990-2009 time frame. It was largely the result of a 419-MMTCO2e drop in carbon dioxide (CO2) emissions (7.1 percent). There was a small increase of 7 MMTCO2e (0.9 percent) in methane (CH4) emissions, and an increase of 8 MMTCO2e (4.9 percent), based on partial data, in emissions of man-made gases with high global warming potentials (high-GWP gases). (Draft estimates for emissions of HFC and PFC substitutes for ozone-depleting substances in 2009 are included; 2008 data are used for emissions of other high-GWP gases.) Emissions of nitrous oxide (N2O), on the other hand, fell by 4 MMTCO2e (1.7 percent). The decrease in U.S. CO2 emissions in 2009 resulted primarily from three factors: an economy in recession, a particularly hard-hit energy-intensive industries sector, and a large drop in the price of natural gas that caused fuel switching away from coal to natural gas in the electric power sector. Methane emissions totaled 731 MMTCO2e in 2009 (Figure 1), up by 7 MMTCO2e (0.9 percent) from 2008. Increases in energy-related methane emissions—largely from underground coal mining—were offset by decreases in emissions from agricultural sources. Methane emissions from waste management systems rose by 7 MMTCO2e, while industrial emissions declined by 0.4 MMTCO2e. Emissions of nitrous oxide dropped by 4 MMTCO2e (1.7 percent) to 220 MMTCO2e. The decrease came mainly from a reduction in energy-related emissions, as well as declines in industrial-related and agricultural nitrous oxide emissions. Based on a partial estimate, U.S. emissions of high-GWP gases totaled 178 MMTCO2e in 2009—8 MMTCO2e (4.9 percent) above the 2008 level. Emissions of hydrofluorocarbons (HFCs) rose by 7 MMTCO2e (5.4 percent) from 2008 to 2009.